Instructions: Cut a piece of white cardstock 10" x 7" score at 5"and fold to create a 5" x 7" card. Cut a piece of blue patterned paper 5" x 7" and adhere to the card front. Cut a piece of white card 4 3/4" x 6 3/4" and emboss with the Ring the Bells embossing folder. Die cut the oval from the embossed card using the largest plain edge die from the HCD1-7156 Eyelet Oval & Basics Small die set. Adhere to the base card with foam tape. Die cut the oval from the patterned paper panel using the largest plain edge from the HCD1-7156 Eyelet Oval & Basics Small die set and adhere inside the oval recess. Die cut the eyelet edge from the largest plain edge die from HCD1-7156 Eyelet Oval & Basics Small die out of blue patterned paper and adhere to the oval. Die cut a white frame from the largest plain edge die from the a HCD1-7156 Eyelet Oval & Basics Small die set and the second largest plain edge die from the HCD1-7157 Eyelet Oval & Basics Large die set In white cardstock and adhere to the oval frame. Stamp the left and right side bough and baubles images from the HCPC-3836 Merry Little Christmas stamp set in Sepia ink on white cardstock. Colour the boughs with Peanut Brittle ink and the baubles with Pink Peony, Ultramarine Blue, and Vivid Chartreuse inks before die cutting with the coordinating die. Add snow and glitter with Dries White glue and Ultrafine Crystal glitter. Shape and adhere to the top right of the card over the oval. Stamp the pine images in Library Green ink from the HCPC-3838 Merry and Bright Accents stamp on white cardstock. Colour with Leaf Green and Fern Green inks and die cut with the coordinating die. Shape and add Crystal Clear to the pine leaves and adhere around the top half of the frame. Stamp the pinecone images with Sepia ink on white cardstock and colour in with Peanut Brittle ink. Shape and adhere around and among the pine leaves as shown. Stamp the images from the HCPC-3680 Sparkling Poinsettia stamp set in Garden Patina ink on white cardstock. Colour with the Garden Patina ink and die cut with the coordinating die. Shape the poinsettias and assemble. 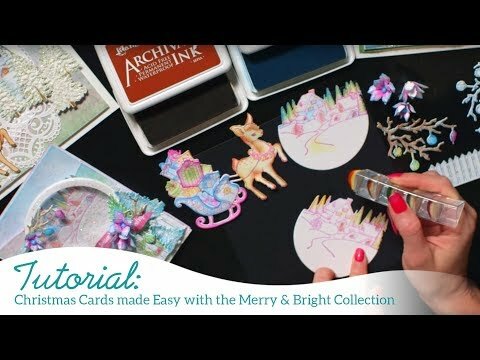 Add Crystal Clear glitter to the flowers and Minnie Pearl Prills to the centres and adhere to the top right of the card. Stamp the leaf images from the HCPC-3679 Large Sparkling Poinsettia stamp set in Library Green ink on white cardstock. Colour with Leaf Green and Fern Green inks and die cut with the coordinating die. Shape and adhere around the poinsettias as shown. Stamp the bauble image from the HCPC-3838 Merry and Bright Accents stamp in Vibrant Fuchsia and Forget-me-knot inks in on white cardstock. Colour the pink flowers with Pink Peony ink and the blue flowers with Forget-me-knot ink before die cutting with the coordinating die. Using a Dove Blender pen colour the accents on the pink baubles with Forget-Me-Knot ink. Shape lightly with the Deluxe Flower Shaping kit and add Ultrafine Glitter to the baubles with Dries Clear glue and a damp sponge. Add the baubles to bottom right of the shadow box frame as shown. Stamp the ball garland from the HCPC-3838 Merry and Bright Accents stamp set in Shadow Grey ink on white cardstock and die cut with the coordinating die. Add Simply White Nuvo Drops to the garland and sprinkle Crystal Ultrafine glitter over while still wet. When set trim and adhere among the baubles and pine leaves on the top right of the oval over and around the accents. Stamp the small poinsettia images from the HCPC-3838 Merry and Bright Accents stamp set in Forget-me-knot ink and colour in with the same ink before die cutting with the coordinating die. Shape these lightly. Shape using the Holly and Poinsettia 3D shaping mold and assemble once dry. Add Crystal Clear glitter to the flowers and Minnie Pearl Prills to the centres and adhere as shown. Stamp the holly leaves from the HCPC-3838 Merry and Bright Accents stamp set in Library Green ink on white cardstock. Colour in with Leaf Green and Fern Green inks and die cut with the coordinating die. Shape the leaves and add Crystal Clear glitter and adhere around the small poinsettias. Die cut the tag from the paper and shape lightly and adhere to the bottom left of the card. Add pinecones, pine leaves and a poinsettia to complete the card.